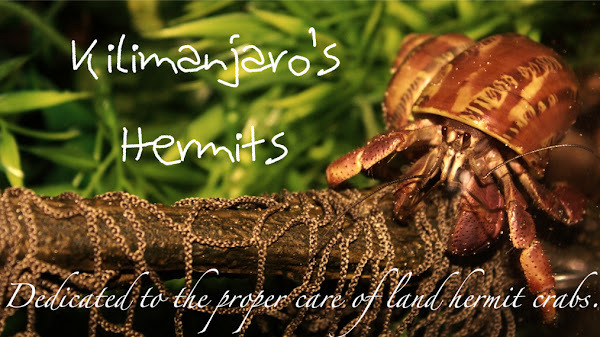 Kilimanjaro's Hermits: The White Worms Are Destroyed! A Huge Deep Clean! The White Worms Are Destroyed! A Huge Deep Clean! In the past days, I have been finding tiny white worms in the water and substrate in the tank. The sand was beginning to grow old, and I knew a deep clean would be a good idea. After having two hermit crabs die in the conditions, I have decided to replace the substrate and cleanse everything. Yesterday the entire deep clean process began. I took everything out of the crabitat and threw the old sand out. Needless to say, I kept a small bag of sand and cleansed it to use in one of my kibbles. I had bought two bags of playsand and one brick of T-Rex Forest Bed. After soaking the forest bed for thirty minutes, it still wasn't digging consistency so I just decided to only have a small portion of the tank with the Forest Bed. 3/4 of the new crabitat is play sand, which is new to my crabs. The entire crabitat is looking nice, but I am still ordering a few new additions that need to be added. I'm looking forward to having a moss pit and shell station using corner shower caddies. Additionally, I am hoping to get my ten gallon set up with three tiny Ecuadorians (Shark, Tsunami, and Shinto) by Christmas. I'm still unsure of how to convince my mom I need more crabs.